Cairo: Egyptian protesters, pushing for massive changes in the country, have balked out at a plan unveiled by Prime Minister Essam Sharaf to meet their demands. "The government has lost its revolutionary legitimacy and should resign," Khaled Telima, a member of the protest Revolution's coalition, said shortly after the Prime Minister promised to reshuffle his cabinet within a week. Sharaf, who became a prime minister in late March, said in a televised address late Monday that the nation's governors would also be reshuffled by the end of July and vowed to hold public and swift trials for officials from the regime of former president Hosni Mubarak involved in a deadly crackdown on pro-democracy protesters earlier this year. "We will continue our (open-ended) strike in Al Tahrir square," Telima told the private TV Al Tahrir. Hundreds of Egyptians are camping out in the central Cairo's square and in other big cities around Egypt in protest at what they say the slow pace of prosecuting Mubarak and tainted former officials. 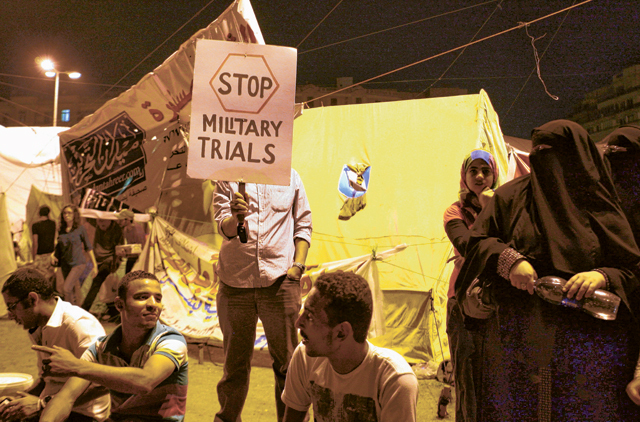 Mubarak was swept aside in a popular revolt in February after 30 years in power. Protesters demand that key state institutions, mainly the Interior Ministry and the media outlets, be purged of loyals to Mubarak. "We plan several marches [Tuesday] to demand the government's resignation," said Telima. Sharaf said he had ordered the Interior Minister to sack policemen accused of involvement in shooting at civilians during the anti-Mubarak uprising. At least 846 were killed and more than 6,000 injured during the revolt, according to a fact-finding commission.